In Argentina, the mobile communications market is dynamically developing, mobile penetration has reached 145% (with a population of 44.7 million). After Brazil and Mexico, the country ranks third in Latin America in terms of mobile sector development. 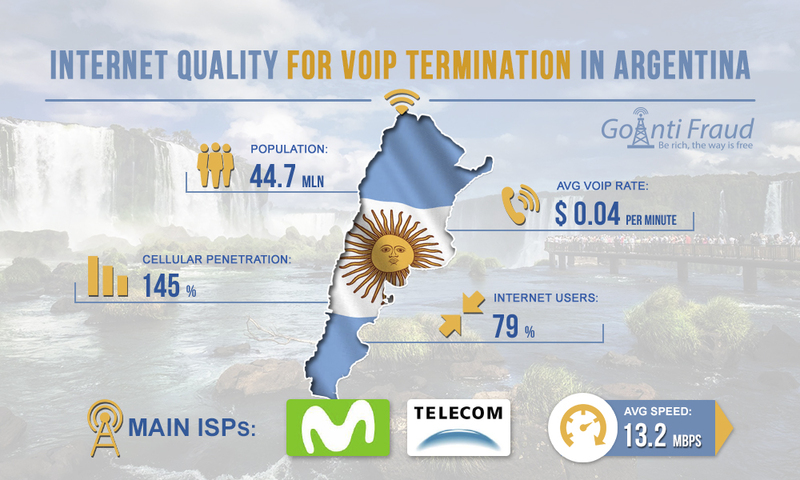 With large volumes of international voice traffic, Argentina has a cheap local connection, which allows you to make a good profit on termination of calls. But what about Internet connection? The indicator of broadband Internet penetration in Argentina is 79% (about 34.7 million connections). This is one of the highest rates in the region. Despite economic and political difficulties that have negatively impacted investments in the telecommunications sector, there have been steady improvements in the Internet services sector. Investments had a positive impact on the quality of service provision and, in particular, on the average Internet speed in the country, which increased to 13.2 Mbit/s (in 2016 this figure was 5.3 Mbit/s). This is a great speed for smooth operation of voice modem voip gateway even with a large number of channels. The local Internet services market is still somewhat affected by limited competition. The DSL sector is dominated by two providers, Movistar and Telecom Argentina (which also provide mobile services in parallel). They account for about ⅔ of all fixed broadband connections. Their only significant competitor is the cable provider Cablevision. At the end of 2010, the Argentina Conectada national program was launched, in which broadband services were deployed in underserved areas. Also, the country settlements began to be connected to the fiber-optic network. Thus, today the broadband market in Argentina is in the stage of active development, which positively affects the opportunities for starting a business in the field of termination.